El cormaco has been away for a while, he hasn’t said where he’s been, but he wandered into Ibrox one day and left his tape recorder running….so he says, anyway. SR: Pedro, please come in, sit down. PC: Hi guys, it’s so good to see you today, so good, really, I’m meaning it, I’m so happy to see you all today. PM: I’ve got a game of golf in an hour Pedro so we need to get through this, alright? PM: (whispered) oh for f*cks sake, might a thought about how to get through Progres ..
SR: Pedro, again, time is a factor, I’ll just go through the items on my agenda and you can give me your thoughts, okay? 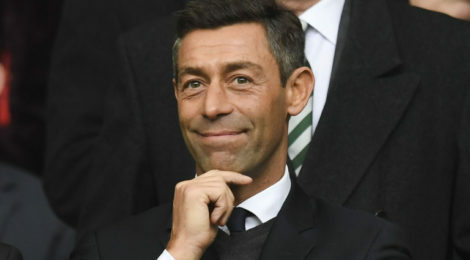 SR: So Pedro, first item, first team squad – player sales and player recruitment – we have sold McKay, Waghorn, Garner, and sne tout O Halloran and brought in Alves, Pena, Dorrans, Herrerra, Candeias, Jack, Dalcio and others who I’m afraid I can’t remember at this point – how do you feel the squad is looking now? PM: Pedro, sorry, stopping you there. Let me try another way – you sold players for peanuts who are now scoring goals in England, and brought in a load of guys who look either unfit, useless or both, and have spent plenty money to do it…. PM: Well, what about it, are any if these donkeys ever going to cut it? SR: Pedro. Sorry, results. As in the score line of matches, at the end of the game. How do you think they have been going? PM: Pedro, whist. The results are shocking. Why, and what are you going to do about it- answer that please? PM: Oh holy f*ck. Right, enough, I’m outta here. Stewart, we’ll have to ask Dave to ask Jim to ask Keith to write that Pedro’s resigned, I can’t put up with his sh*te any more! Absolutely brilliant!! Extremely funny. Spewed my coffee over the keyboard. Enjoyed it so much, I read it twice. Well done! Superb! Just like actually listening to the eejit in person. Leave your tape recorder lying about again, big man. The man is a straightjacket case. brilliant stuff. the man is a dribbling loon. Sadly the wee Spaniard in Fawlty Towers is no longer with us.